New version with the open/close parenthesis symbols on the [STO] [RCL] keys and the Undo on the [÷] key and Backspace on the [-] key. 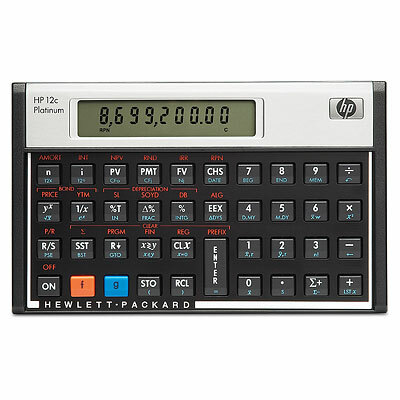 This is HP's upgrade from the 12C calculator and was released in June 2003. The industry choice for real estate, banking, and finance. RPN and algebraic entry - an hp 12c platinum breakthrough. Four times more user memory than the HP 12c. More than 130 built-in functions. Millions of users attest to HP 12c reliability. Refurbished units when listed have been individually tested by one of our experienced staff and come with a 90 day warranty through us. They include the calculator and batteries. We are no longer able to procure paper manuals but the manual is online in PDF.